What kinds of auctions can I hold? What a silent auction is and how it’s different from other auction types like live, online, and mobile/electronic bidding auctions. How much does it cost? Venue, food, decorations, entertainment… the costs of an auction event can add up fast. We’ll give you some tips on setting your budget and getting the most bang for your buck. How can ReadySetAuction help? Don’t worry — we’re not going to try and trade a “white paper” full of sales pitches for your email address. If you think ReadySetAuction sounds like it might be useful, though, there’s a form at the bottom of the page to request a free trial. What Kind of Auction Should We Hold? There are a few different kinds of auction formats. Which is best for your organization’s fundraiser event depends on the atmosphere you want and the preferences of your audience. In a silent auction, bidders peruse auction item displays that are set up on tables. They bid by adding their name (or bidder number) and bid amount to a paper bid sheet for each item they want. This paper bidding takes place during a specific window of time at a larger event — often with food and possibly entertainment. When bidding ends, those with the highest bids win. Silent auctions get their name from how they differ from live auctions. In a live auction, an auctioneer calls out prices and takes bids when people raise a numbered paddle in response. Many auction events have both silent and live auction components. Online auctions are only possible with some kind of auction software. eBay first popularized online auctions in the 1990s. Since then, online auctions have become a staple of modern nonprofit fundraising efforts. Things in an online auction work much as they do in a silent auction except that, instead of items displayed on tables, bidders browse web pages about each auction item and place their bids online. Online auctions work well as stand-alone fundraisers for charities with far-flung supporters who can’t easily gather for an in-person event. For causes with a strong base of local support, an online auction can work well as a lead-in to a gala auction night by driving bids higher for several days in advance of the event. ReadySetAuction has been helping organizations hold online auctions for over a decade, and we’ve seen both strategies work well. These two varieties of software-assisted bidding are sometimes synonymous, and usually focus on event night at the venue. The first electronic bidding systems used complex and expensive custom hardware systems. However, the advent of the web and small mobile devices like smartphones has significantly lowered both cost and complexity in recent years. For example, ReadySetAuction enables guests to bid on their smartphones during the event. For guests without a mobile device, you can set up a number of tablets or laptops (or virtually anything that can show a web page) to serve as secure “Bidding Stations” during your event. Check out another blog post we wrote for help deciding if mobile bidding is right for your auction event. The cost of holding an auction fundraising event can vary greatly by location, but there are some useful decision-making strategies that will help. As with most things, planning and preparations are key to ensuring you get the most from your budget. The total cost of an auction fundraiser event can vary widely depending on costs in your area, your ambitions for the event’s style, and your fundraising goals. You’ll need to do some research and careful decision-making to come up with a realistic budget for your event’s venue, meals, and decorations. Depending on the kind of event you’re having you may also need to budget for entertainment, an auctioneer, and more. This may be starting to sound intimidating, but you can make sure your overhead is covered by selling admission tickets to your event at the right price. To calculate a minimum ticket price, divide your total estimated overhead costs by the number of people you think you can reasonably expect to attend. For example an event with an estimated $7,000 in overhead and a goal of 200 guests would need to charge at least $35 per admission ticket to cover the overhead and keep all the fundraising proceeds from the auction. It’s smart, however, to pad the ticket price by about 20%. This keeps you covered in case you don’t reach your attendance goal or costs are higher than expected. So the $35 ticket for our example event becomes $42, which you could easily round up to $45. There’s a lot of flexibility in event ticketing. Some events break up coverage of their venue and meal overhead by selling separate admission tickets and meal tickets. You might go for an exclusive feel with an extravagant venue and admission tickets that cost several times the per-person overhead. Raising ticket prices turns your tickets into a profit center for the event, and — if your attendance estimates are accurate — guarantees you make two or more times your event costs. Whatever your ticket strategy, you can make it work better for you by either lowering ticket costs or raising ticket profits with the money-saving tip in the next section. The auction venue, food, and decorations are where you’ll spend a significant chunk of your event’s budget. The obvious solution is to use whatever your organization already has on hand, for example by holding the auction in your school’s gymnasium. However, a shrewd fundraiser may be able to get a high-end venue and services at a steep discount. Does an ardent supporter of your cause own or manage a local hotel? She might be able to secure use of the ballroom for little or no money. Is there an alumnus of your school or parent of a student that runs a catering company? He may be willing to donate food preparation and waitstaff for your event. Such “gifts in kind” (donated goods or services instead of money) can offer significant savings for your organization and a significant tax deduction for a local business. You can even sweeten the deal by offering to prominently recognize these in-kind donors as sponsors of your event. The more event-night accommodations you acquire from such sponsors the lower your ticket price can be, making the event more accessible to your supporters. We covered some of the ways auction management software can be useful above, in our description of different bidding styles. But the fact is, you might not need auction software at all. If you do, there are a number of ways it might factor into your auction budget depending on how it’s paid for. If your event is small, with only a handful of attendees and auction items, software to manage it may be an unnecessary expense. Some fundraiser events focus on cash donations or high ticket prices for an exclusive or stylish event, with a small number of silent auction items as little more than a sideshow. Other events may feature a couple dozen silent auction items and a handful of live auction items, with no connection between the silent and live bidding and no pre-event online bidding at all. Events where the auction is simple and small can safely get by with some good volunteers, a few spreadsheets, and a good organizer running the show. In fact, this is often a good place for organizations to dip their toe into the auction waters and see how it suits them. The larger and more complex an event becomes, the more helpful software can be. Once you have several dozen donors and guests to keep track of, to say nothing of a hundred or more auction items, tracking things on spreadsheets starts to break down. Seating arrangements and meal choices, donor acknowledgement and guest checkout — it can get stressful. And that’s just the start. ReadySetAuction has served auctions with several hundred guests and donors, several thousand donations and auction items. At that scale professional auction management software isn’t just a relief, it’s a necessity. Auction software advertised as “free” often costs money in fees and paid support. Open source software truly does cost nothing in terms of money, but can be time consuming to support. Other software costs a flat price up front, though there may still be “gotchas” to look out for with some products. Here are some pros and cons of different auction software pricing models, and things to keep in mind for your event. Software that comes with no up-front cost may make its money with paid support instead. If not, be on the lookout for service fees that go by names like “performance fee” and work by taking a percentage of your auction proceeds. To be fair, this might not be a bad deal for events with a small fundraising goal. If you only aim to raise $2,000, a 6% performance fee of $120 may seem very reasonable. But if you want to raise $50,000, the resulting $3,000 fee would take a big chunk out of your bottom line. Our four service plans range from $495 to $1,995. You pay up-front, and the cost covers as many events or online auctions as you want to have at that same service level or lower within the same calendar year as your initial purchase. If you want more features than the service level you bought that year, you can upgrade for the difference in price between the two. We think this is the best option for most non-profits — that’s why we do it. We’re also well aware that we aren’t the only company with this kind of pricing model. However we pride ourselves in standing apart in one important way: we post our pricing clearly and completely on our website. We’re very straightforward and honest. As you shop around, keep an eye out for extra fees and charges like paid support. Some companies also automatically renew your account on an annual basis, unless you’re careful to opt out. Renewal for ReadySetAuction is never automatic — it’s under your control. And the only extra charge you’ll encounter that isn’t explicitly described on our pricing page comes from credit card merchant account providers and their processing fees rather than from us. 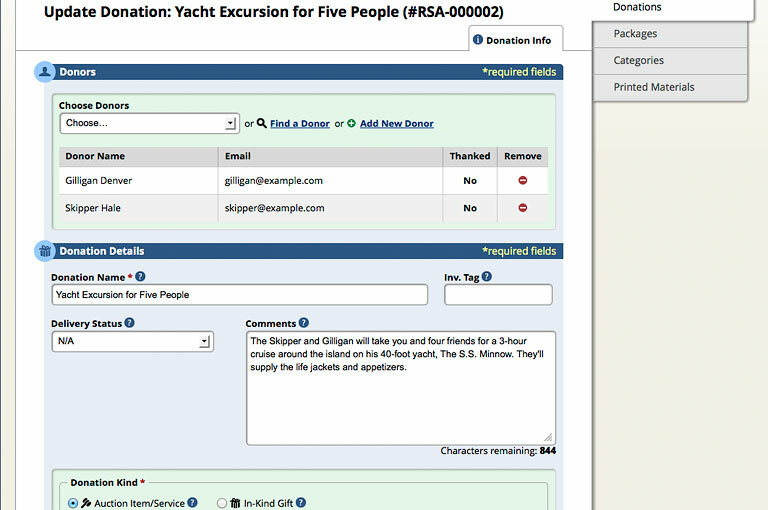 If reading this has helped you decide that your fundraiser may need auction software to stay organized and be successful, we may be able to help you. Get a free trial of ReadySetAuction by filling out the form on this page, or call us at 888 • 824 • 0490 to discuss your needs. If you’ve decided that auction software won’t be necessary, you may still get some help from our many blog posts on silent auction strategies and tips. Thanks for taking the time to read our short guide to silent auctions. Best wishes for a successful event!